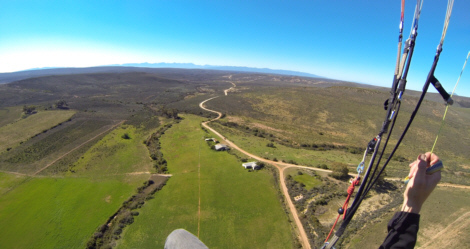 DESCRIPTION: Klein Karroo on the one side of the ridge, the Overberg on the other. - Ceiling: Cape Town UTA Area B, FL145. - Land on any open field west of the farm entrance road. - East of the road is in rotor. - Landing is on private land belonging to different landowners. - Be friendly when approached. CAUTIONS: Winter site. Can be strong in summer. DIRECTIONS: On R62 turn at sign for Brandrivier (outside Barrydale). Take turn to Gysmanshoek pass. Turn into farm when you see the sign for Kanetberg. Sign in there first. SITE RULES: Private Land. Please read the site rules before flying. - Through Kaapse Buitepos Klub only. - The site was re-opened by the club in 2013 after a two year closure due to bad behaviour. RECORD: 46 km. Stef Junker 2002. Landing at Barrydale by Eugene Claase.